The Welsh language – Cymraeg is part of the Celtic family of languages, and remained with the Celtic people when they fled westwards to an area now known as Wales. The fact the welsh language continues today is testimony to the pride of the Welsh nation. 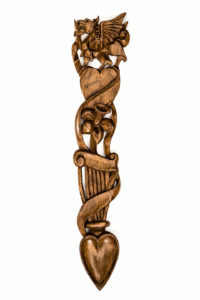 Many customs have also surveyed one being the art of giving Love spoons by the men of Wales – and dates back to the 17th century. The men who carved the spoons were not the landed gentry, and what ever they lacked in formal education, they made up for in abundance by developing there natural skills and creativity. He would spend many hours decoratively carving the handle of the wooden spoon and present it to the young girl in the village as a token of his love and affection.